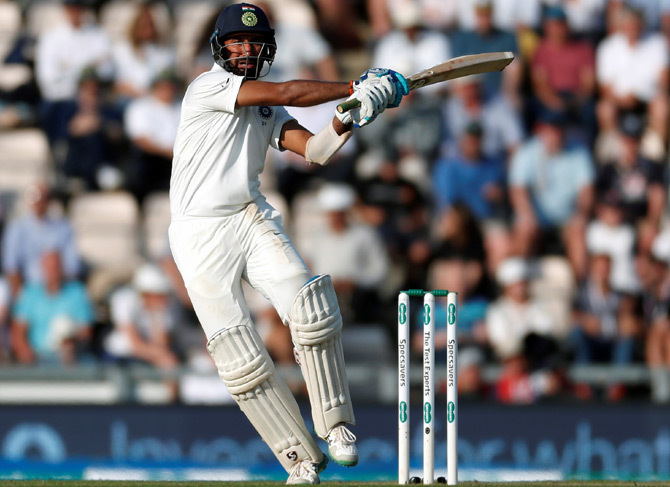 The England-India series has brought the bowler back into what has been turned into a batsman's game, says Aakar Patel. 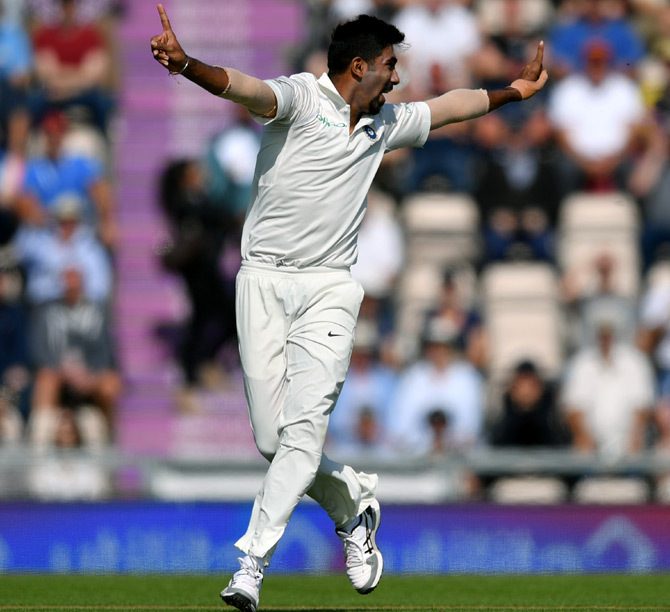 IMAGE: Jasprit Bumrah celebrates after taking Keaton Jennings's wicket in the Southampton Test. I must confess I have really been enjoying the cricket series in England. The first thing is that it is happening at the right time of the day. One can return from work and still see the most part of the day's play. And one can do it in the best way possible, over a drink or two. This particular series to me has been riveting also because it has brought the bowler back into what has been turned into a batsman's game. England losing its entire side in just one session is an example of that. The rules over the years have been very unfair to the bowler. The one bouncer limit per over thing, for instance, has made cricket less menacing and more boring. Then the change in the front foot rule for no-balls (in the old days a bowler needed to have the back foot behind the line and that was all that was required). In limited overs cricket, the field restrictions and the absurd leg side wide and the use of two balls -- all of that has been to favour batsmen. 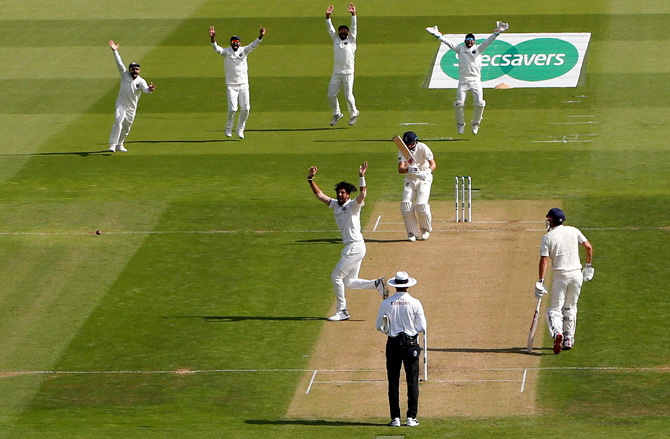 That is why it has been so satisfying to watch the Test cricket series in England brought alive by the bowlers. I heard a fascinating thing said by commentator and West Indies legend Michael Holding. 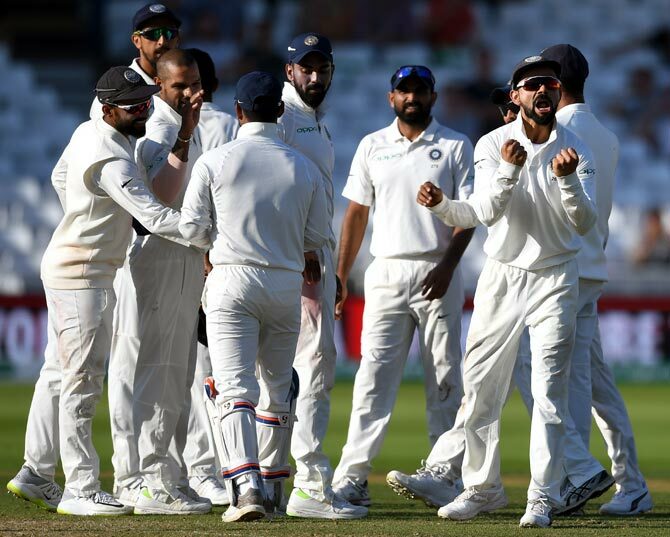 The four Indian quick bowlers in that third Test -- Ishant Sharma, Mohammed Shafi, Jaspreet Bumrah and Hardik Pandya -- were each of them faster than the four quick bowlers for England -- James Anderson, Stuart Broad, Ben Stokes and Chris Woakes. Holding remarked that he had never ever heard of that before, an Indian touring side with faster bowlers than the home side. How amazing. And there has been some first-rate fielding to support the quick bowling. Again, there was an interesting statistic from the series. That 20 catches in all had been dropped and of those 15 had been dropped by England. Sunil Gavaskar had written in one of his early books about something he had been told on his first tour to England. The belief then was that Englishmen never dropped catches at slip and so if you snicked, you walked without looking behind. Gavaskar wrote this in dismissive fashion, and rightly so. Indian fielding in the last 15 years has caught up to a large extent with the rest of the world's (meaning the world outside of South Asia, of course). The athleticism and the sliding stops and that sort of thing has been on display in Indian sides for some time now. But this is the first time that I saw consistently good slip catching. This has never been something that we have been known to be good at doing, possibly because we have never had to be good at it given the lack of quality fast bowlers. Few things are as satisfying as seeing your fellows keep bowling around 145 kmph for whole sessions, with the batsmen uncertain and the slips cordon packed and energetic. Of course there is some excellent batting, as Virat Kohli showed in the third Test. But it is not the kind of batting that we are used to in the modern era; meaning one that is flowing and full of boundary hits. This is what Test batting is meant to be -- dour and defiant. I like that as well. I find T20 cricket to be a sort of item number, enjoyable as a distraction but you cannot make a full movie out of it. For me, slow and boring and hard Test cricket is the real deal. India, and I have written about this before, has ruined Test cricket by making the dullest pitches in the world. Also the very noisy atmosphere, the dust, the lack of carry on the balls, the ugly stadiums and the ridiculous amounts of advertising, all make the experience unpleasant. I like watching Test cricket in England, Australia and South Africa. I find New Zealand's grounds far too small, a sort of miniature form of cricket, and the West Indies plays its matches at a time when it is not possible for us to watch. The other thing about this series is Virat Kohli's aggression. When we lose, as we did in the first two games, it seems quite embarrassing to have this individual strutting about all the time. But when we are winning, the same bellicosity takes on a more pleasing aspect (to us, that is -- I'm sure it's irritating to our opponents no matter whether they're winning or losing). The last thing is that I am also watching with a sense of nostalgia. One of the first 'adult' books I read was Ajit Wadekar's My Cricketing Years. It was published in 1973 and, though it was narrated in the first person, it was actually written by K N Prabhu, a very fine writer. Wadekar was captain of the Indian team in the period when it had that strange but beautiful bowling attack that was comprised entirely of spinners: Bedi, Chandrasekhar, Prasanna and Venkataraghavan. Someone like Solkar would bowl a couple of slow medium overs to scuff up the ball and the spinners would come on, usually with the openers still batting. In that Wadekar book, there is also a reference to the young genius who scored 774 runs in a series in the West Indies in 1971, Sunil Gavaskar. 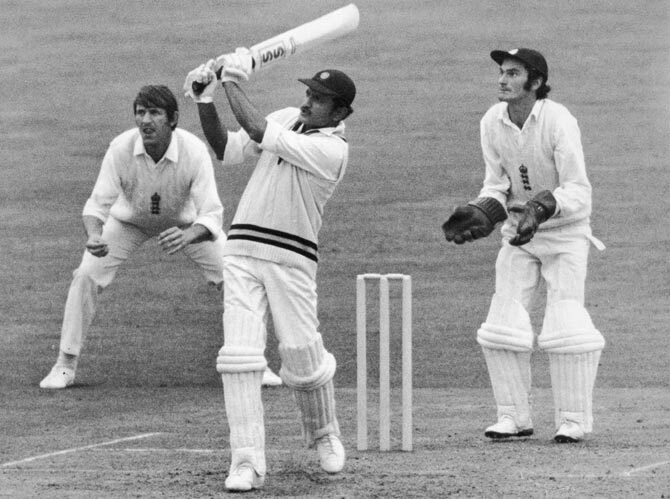 Wadekar's side defeated the English in that series and it also defeated the West Indies under Sobers. Nothing that our team has done since then, including winning two World Cups, to me has been as satisfying as those early wins abroad. I am reliving something of that same sentiment these days with the series against England and for that I am very grateful.